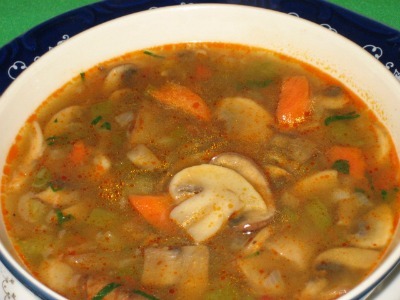 Deliciously different in flavor and texture this diet mushroom soup is also packed full of vitamins and nutrients. What so different about this vegetable? Mushrooms are often thought of as a vegetable, but they are actually a type of fungi. Though the word fungi may not sound too appealing, this wonderful food can provide a whole lot of good stuff that certainly makes up for its name. Mushrooms have been around for thousands of years and have been used as both food and for medicinal purposes. They are very low in calories, fat and sodium but contain about 80 – 90 percent water. Depending on the variety they are a good source of fiber, potassium, phosphorus, copper, manganese, riboflavin, niacin, and selenium and B-group vitamins including folate. 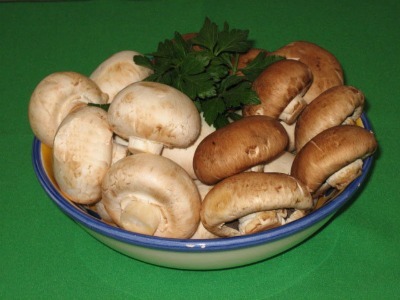 There is a large variety of mushrooms to choose from but the most commonly eaten is the white button variety. While even the most common forms of mushrooms have many nutritional benefits, it is worth trying some of the more unusual varieties like portabella and shiitake. Any kind of mushrooms will work well in this recipe. We chose to use a mixture of white button and crimini mushrooms just to add a little variety. Put onion in a soup pot with oil and sauté until transparent about 3-5 minutes. Add the rest of the vegetables, spices and 1 tablespoon of parsley into the pot with the onions. Turn stove to medium high and sauté vegetables for 3-4 minutes. Now add the flour, mix gently and sauté for another 3-4 minutes. Add all the liquid into the pot. Bring soup to a boil and reduce to low, simmer for about 15 minutes or until vegetables are tender. Now add the remaining 1 tbsp of parsley. When you add a little fresh parsley to the soup, after it has been cooked, this adds a special zest that enhances the soups flavor. If you make 4 servings out of this recipe, each serving would be approximately 111 calories per bowl. Amazing right?